A year ago this parcel of land was contaminated with old ordnance. 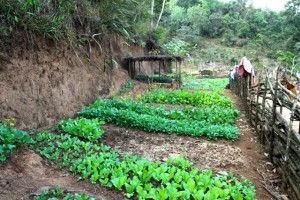 Now, it is a garden supplying food for the family and produce for the local market. Last evening near, Dak Lie village, we visited with a family who last year asked us to clear a parcel near their fishpond so they could plant a vegetable garden. They envisioned harvesting fresh greens not only for their table, but possibly in an abundance that would permit them to market produce to others in the village. What a thrill it was to see what they’ve done with that once dangerous piece of land! It’s a small parcel but it’s now both bountiful and beautiful. In dry weather the owners dip water from the pond to water plants, and among the plants that they grow are select species that they feed to their fish. I’d love to lay claim to having cleared the land for their fishpond as well, but my memory fails me. Was it one of the forty-six ponds we cleared two years ago? With so much land put to new uses the scenery here is getting to be difficult to recognize. Each year my wife and I open our family farm to Hmong refugee families who would like a free garden space. Throughout the growing season we walk those gardens and marvel at the diversity of plants we see. We suspect that many of the unique varieties of squash, beans, corn, and salad greens thriving on our Wisconsin soil, are descended from seeds secreted out of Laos by refugee families nearly forty years ago. Last night I recognized varieties identical to those our Hmong friends grow on our farm: mustard greens, lemon grass, Asian eggplant, garlic, onions, and several “soup greens” that have no name in English.